29th year old Virat Kohli achieved in 117 ODI innings in comparison to Sachin Tendulkar who took 142 innings in order to accumulate 600 ODI runs in Asia. and overtaking none other than legendary batsman Sachin Tendulkar. Virat Kohli has scored 4050 runs at home with 899 runs in Sri Lanka from 23 innings and 970 runs in 15 innings while in Bangladesh. He has never played any ODI cricket in Pakistan over his career, unlike Tendulkar who has enjoyed his fair share of cricket on Pakistani pitches. This is how big the gap was between when Virat Kohli reached 10,000 ODI runs and the next quickest, Sachin Tendulkar. He also scored 1,000 runs or so in 11 matches. 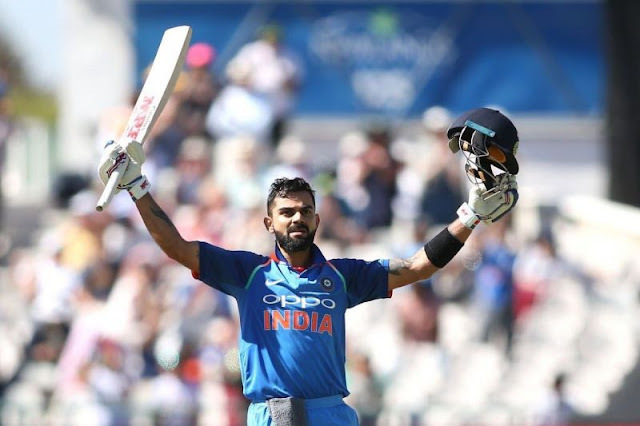 The world No 1 ranked ODI batsman, Kohli has smashed records for fun in the recent past, He has done so while picking and choosing which series he plays. India team as they lost he third ODI against West Indies at MCA Stadium in Pune by 43 runs. Kohli scored 107 runs off 119 balls was not enough to win the match as they were dismissed for just 240. 1- Kohli has teken 117 innigs to scored 6000 runs in Asia, the fastest by a batsman. 2- Virat Kohli scored 404 runs so far in the ongoing series against west Indies. He overtook AJinkya Rahane's tally of 336 runs which he scored last year. 3- He became the first ODI batsman who score three consecutive hundreds in ODI. 7- Become the third batsman after S Tendulkar and Dravid to score 8000 international runs in India. 8- He became the third batsman after Babar Azam and AB de Villiers to score four consecutive ODI hundreds in a particular country. Sourav Gangualy rounds off the top 5 list after accumulating the run tally in 157 innings. He said, I never thought I could achieve this feat or I would get to this stage . I always thought that I wanted to play for India. I Never thought that this day would arrive. It just tells me that if you staff focused on the process and stay focused on the right things then these things become irrelevant after a while.